Super-X was but one of many freaks created and then discarded by the Creator over the years. He and a few other rejected young freaks banded together to form the Nixed Men, causing mayhem over a short period of time, mostly by beating up homeless people before setting them on fire. Dragon apprehended the Nixed Men who were sent to the Mutate Manpower Management Service before later being liberated by Freak Force. The Nixed Men joined up with Chelsea Nirvana’s army of freaks as she attempted to seize control of the Vicious Circle during the Gang War. Chelsea was defeated but her followers were folded into the criminal organization nonetheless. 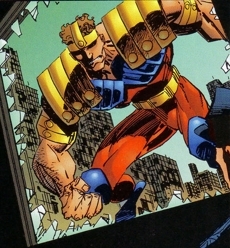 Super-X was one of the first villains brought in by Dragon after he left the Chicago Police Department and became a bounty hunter. Super-X remained with the Vicious Circle for years before reunited with the Nixed Men to once more serve the Creator. His teammates were decimated by creatures under the control of Monster Master and Super-X rejoined the Vicious Circle. He was selected to become part of the Dragon Army that had a serum injected into them created by Dragon’s blood. Super-X was killed by Emperor Kurr as he sought to reclaim his stolen blood.